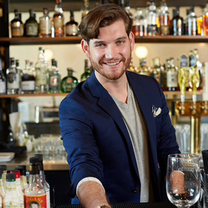 Owner of B&K Classic Cocktails, Beverage Director of Baldoria DTLA, and former Sommelier of Osteria Mozza. "Getting SF started off right! Can’t wait for the whole fam to get here! #fatwashmycocktail"
"If you don't know, now you know! #vesper"
"Don't mind if I do! Pardon me while I'm a #graciaaas"
"Hangover oysters? Don't mind if I do! #otium"
"Sometimes it's hard not to be bitter. #seattle"
"Let the evening begin! #somm"
"WhistlePig 10yr, Grilled Pineapple, Amaro Lucano, Lemon, CBD Oil. Deliciously balanced, perfectly executed." "Come hang out with us tonight @#cocktails"